Magnificent carnival costumes, multicultural musical rhythms, ancient caves with native drawings. Aruba has so many cultural gems to discover. 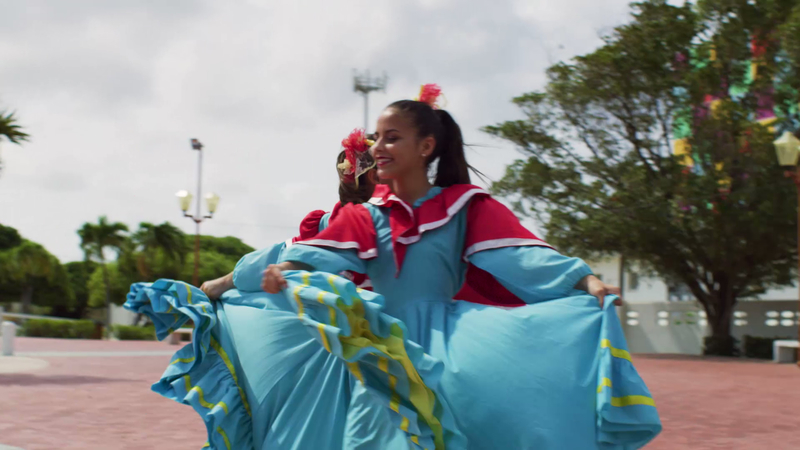 Let Aruba local, and renowned artist, Vanessa, show you some of her favorite cultural treasures on Aruba. Discover one of Aruba’s must-see weekly cultural events, the Bon Bini Festival. Discover some of Aruba’s spectacular historic landmarks and museums. Discover one of Aruba’s artistic wonders, the street art and murals of San Nicolas. My perfect day exploring Aruba’s culture starts with a stroll of our capital city of Oranjestad, with Dutch-inspired architecture and boutique historical museums like Fort Zoutman. From there a trip to San Nicolas, also called “Sunrise City” by the locals. The streets are lined with bright murals, mosaics and street art. I’d also make a stop at the Cosecha shop, with local crafts guaranteed handmade in Aruba. In the evening, local rum and a local band playing authentic Aruban rhythms like the Tumba.